Sometimes you need the second cup of coffee. Am I right? Having a crawling baby that gets into everything and your house isn’t baby proofed because you’re in the process of selling, makes for an exhausted mommy. Bring on the second cup! Well, Mr. Coffee has a single cup brewer is just perfect for that. In the mornings, my husband and I like to split an 8 cup french press, but lately I need that second cup around 2pm when I’m running on empty. All of them have been delicious and it was about time I made a simple chocolate chip biscotti. The semi-sweet chocolate chips in every bite, melting in the hot coffee, makes my mouth water just thinking about it. And usually my husband takes all of the goodies into work with him, but these biscotti stayed right here at home. I ate one every single day for a snack with my coffee until they were gone. Sad. 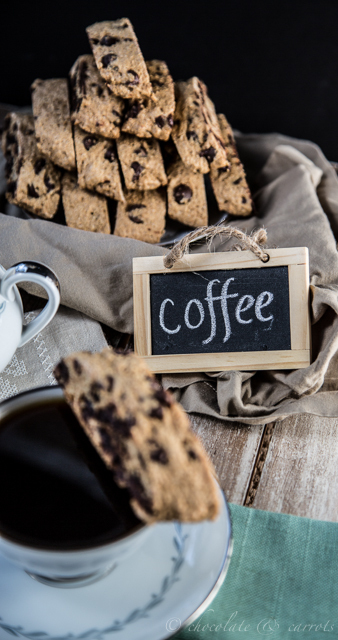 Okay, let’s get back to the hot coffee and delicious biscotti. So the biscotti are so versatile in the fact that you can bake them to the hardness that you desire. I personally enjoy them a little softer than bricks, but no matter what hardness you choose, they’ll soften right up when you give them a little dip in the hot bath…I’m mean, coffee. Go ahead. You know you want to take a dip. 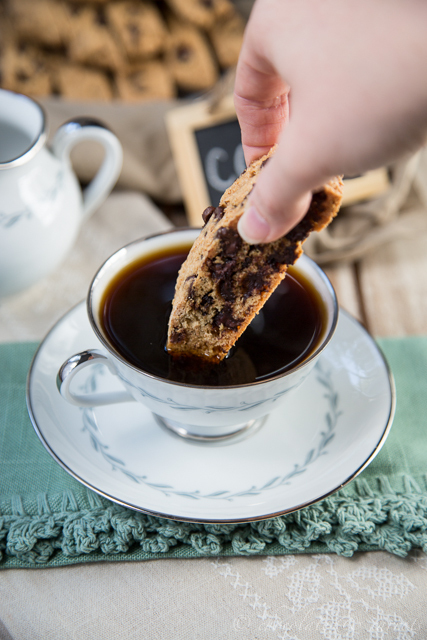 Now you have to make these biscotti and dip them in the coffee yourself. And as you can see, they didn’t last long. If you keep scrolling down the page, you’ll have a chance to win a Mr. Coffee single cup brewer too! 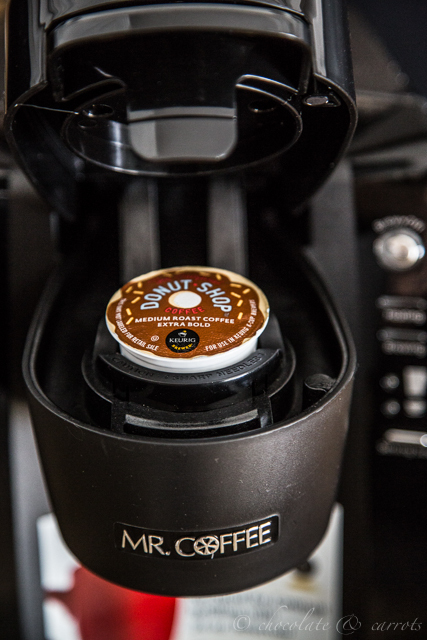 This machine provides the Keurig technology, allowing it to brew all varieties of K-Cup® packs. It also has a 24-oz removable water reservoir, so you’re not refilling it every time, but more like every other time. 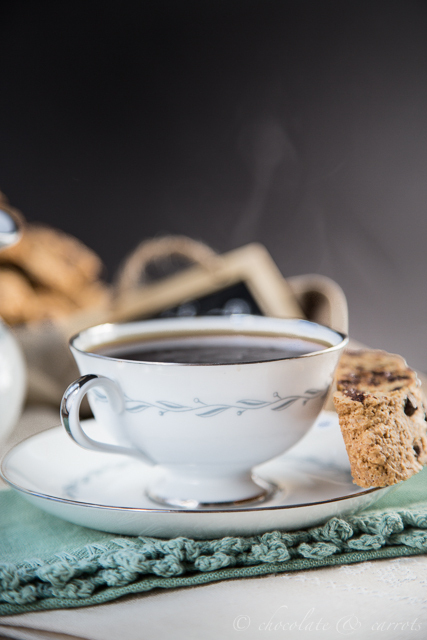 When you brew, you can choose to brew a 6-oz or 10-oz coffee. In a large bowl, whisk the flours, baking powder and sugar together. Add in the eggs and vanilla to the bowl. Stir with a spatula until combined. Divide the dough in half and lay into two long logs on a silpat or parchment paper covered baking sheet, pressing the logs out flat and evenly. If you want small biscotti, make sure you do long and narrow logs. Remove from the oven and with a sharp cerated knife, cut into strips horizontally or on an angle. 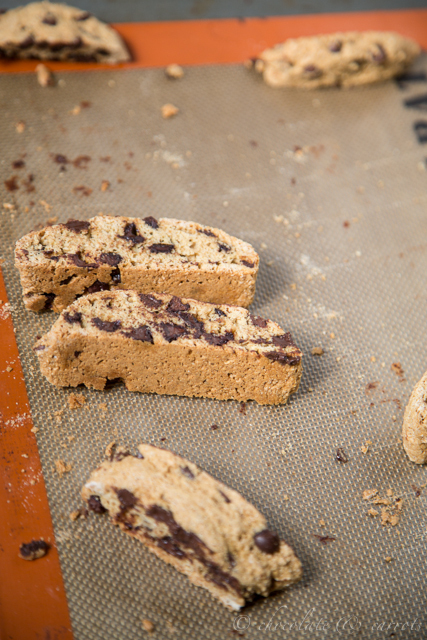 Lay the biscotti on their sides back on the baking sheet. Lower the temperature to 250F and bake again for 30 minutes (just 15 minutes for less hard biscotti). Remove and let cool before storing in an air tight container at room temperature. No purchase necessary to enter. Prizes will only be shipped within the United States. Winner will be selected at random by rafflecopter using Random.org. All entries received after the giveaway closing day and time will not be considered. Entries that do not follow the entry requirements will not be considered. Winners will be notified via email and will have 24 hours to confirm receipt of the email. If the winners do not reply within 24 hours, another winner(s) will be selected. Giveaways will be mailed to the winners’ address. This giveaway has been sponsored by Mr. Coffee. I received a Mr. Coffee Single Cup Brewer to review for this post. All opinions stated are my own. I love baking with whole wheat pastry flour!! YUM!! I love chocolate chip or chocolate chili! My favorite biscottis are homemade ones. They have a subtle softness that the store-bought variety lacks. I like the Almond Anise flavor. I don’t think I’ve ever made biscotti which needs to be remedied immediately! We are french press users too but a quick option would be nice sometimes! I make a delicious cinnamon chip biscotti. Yum! My boyfriend makes a mean orange and anise biscotti. It’s great. Can’t go wrong with chocolate chip though! Cranberry vanilla almond would be delicious! I love the GIF! And these biscotti look incredible. I like vanilla bean biscotti! This looks so good, and the coffee pot is pretty cool! Any biscotti that has chocolate in it! Love that you made these with whole wheat! My favorite biscotti is dark chocolate with walnuts! 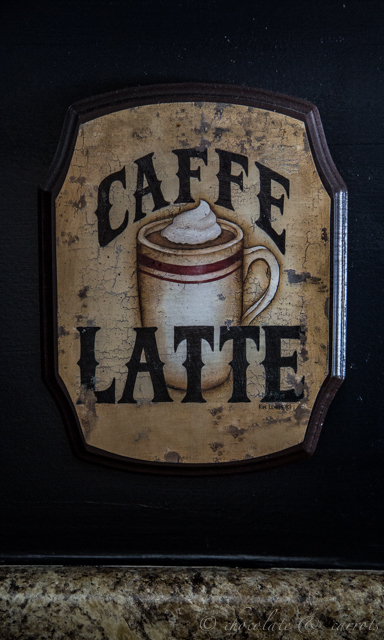 It is the BOMB in coffee! The best biscotti I’ve ever had was dark chocolate salted caramel almond, basically to die for. I adore biscotti! My favorite ones are the dark chocolate dipped but I’d love to try the Pecan Cranberry Biscotti. My favorite flavor is chocolate chip for sure!!!! Ok I am exhausted by time it hits 10am! I try not to make a whole pot of coffee or I would just drink the entire pot. I love the idea of these single serving coffee makers, I have not made the plunge yet on getting one. I would totally love to try a lemon flavored biscotti! I love softer biscotti and any flavor that includes chocolate!! Chocolate & cherry biscotti, that must be a match made in heaven! Salted caramel biscotti is my absolute fave! Chocolate & cherry is my favorite biscotti. Chocolate chip dipped in chocolate! I love chocolate dipped almond biscotti! My fav flavor of biscotti is cranberry white chocolate!! I have NEVER had biscotti before, but this recipe looks like a great introduction to it! My favorite flavor is pumpkin with chocolate chips! pistachio and almonds are my fav! Chocolate chip biscotti is definitely my fav flavor! Good luck with the house selling, we are also in the process and it has been a pain to keep everything clean and tidy! We have 2 dogs and we try to make it look as though we don’t when we have a showing. I imagine it would be even harder with a baby and a dog! I haven’t been baking much so there is less mess to clean.. can’t wait to get back to it and try this recipe!! I would love to try Gingerbread biscotti. Sounds so yummy. Any biscotti that has chocolate in it! I think I may be a bigger chocoholic than you! ok i don’t think i’ve ever had a biscotti…but i sure would take one of your chocolate chip ones…looks perfect to me! My favorite biscotti flavor is chocolate chip. 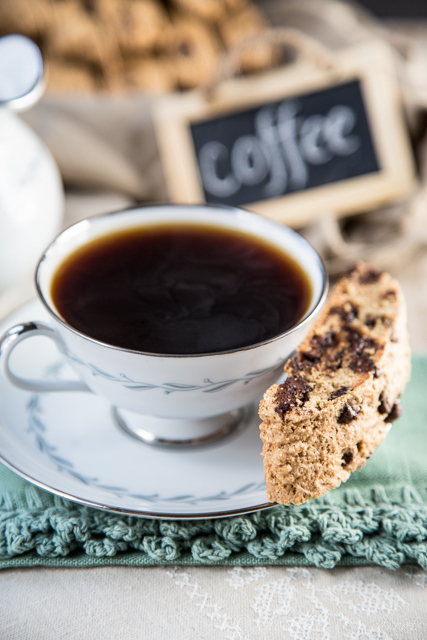 My favorite biscotti flavor is almond with a cup of coffee in the afternoon for a pick me up! I love some chocolate biscotti. Or whatever you made at Christmas time! Chocolate chip because I’m a chocoholic! I love all of Caroline’s Biscotti!!!!! YUM! Vanilla Bean Biscotti is my favorite! Can’t wait to try this recipe! I really like cranberry biscotti! The chocolate chip biscotti look delish! Can’t say that I’m really a biscotti fan but I think this recipe could change my mind. Yum-O!! I love Cranberry,pistachio, coffee bscotti! they are amazing! Some kind of caramel macchiato flavor would be so tasty! Pecan Cranberry is my current favorite. 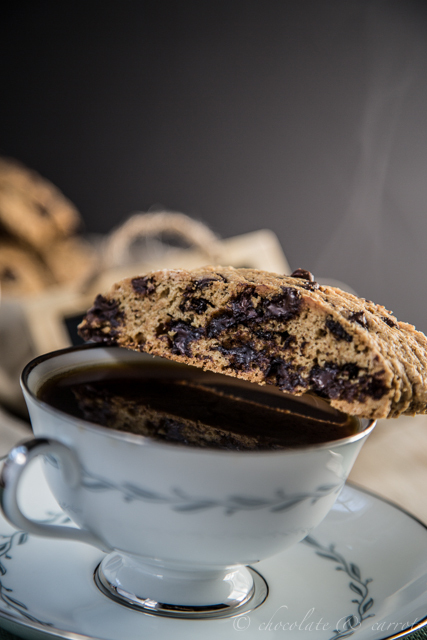 I made a dark chocolate cranberry biscotti recently to share with family and friends and it was to die for! Would love to win! I like chocolate chip biscotti. Gingerbread biscotti dipped in white chocolate is my favorite flavor I’ve made, but after reading the other comments, there are a lot of great combinations I need to try! Yum! Chocolate chip biscotti is my fav! I love chocolate chip biscotti, but I also like having nuts (pecans) in them. YUM!! I’d love nutella, sea salt and espresso biscotti. Thanks for the chance to win. I like chocolate almond biscotti. Thanks Marla! 😀 I need to whip up another batch because they disappeared way too quickly! Chocolate Chip Biscotti’s are my fav! I LOVE pistachio& cranberry biscotti! Lemon biscotti is my fave!